Hi, I never really post any videos of myself as I do have a teacher and he tells me where I need to work to improve next....I have posted in the past a video as I was preparing to perform a piece to perform to a small audience so in that case I wanted as many people to feedback to me as possible, not just my teacher, not that I don't trust him, but I think it is nice to get many 'perspectives' before a performance is due as after all I would be presenting my piece to many people. Anyway, after that I never really post any videos of myself as I think I can't really play ANYTHING well enough to come here and post something to entertain you with, this is the honest truth, I am not writing this to get any attention or any 'here here Jo' replies, this is the true honest opinion of my playing. I hope to be a good violinist one day, but I am really not there yet, far from it. BUT, I have had a couple of people (one especially, you know who you are) who have been kindly asking me to post a video as they are very genuinely interested in hearing how I am getting on/progressing with my violin learning. So here I am posting a video. This piece I only really practiced for 2 weeks, spending approximately 20 to 30 minutes on it per day (5 days a week, so I spent ten days on it). If you wonder how long it took me to play it the way I play it. So I don't find it challenging, although as you can hear, I still play it rather poorly!!! It would take me another 6 months to play it 'ok'. My master's composition made for us during those old days. 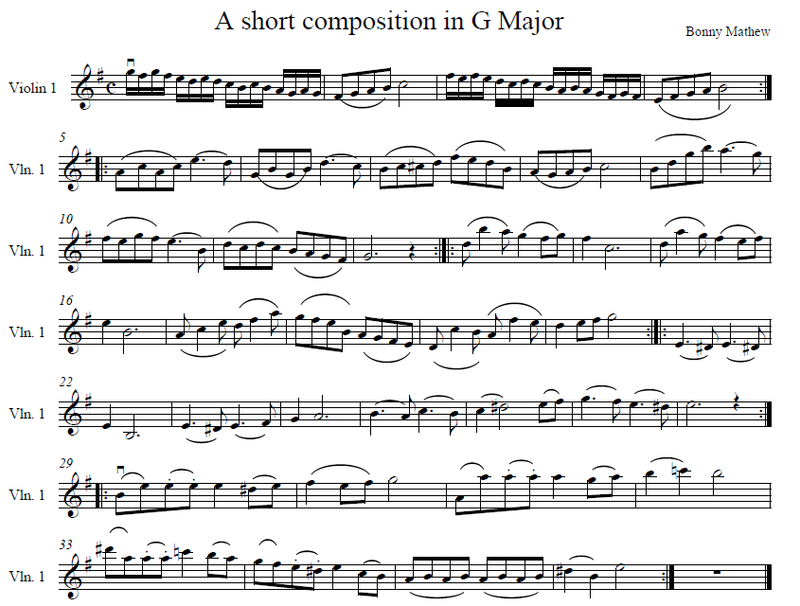 Copied to Sibelius software now, from my old notation book that I still keep as a treasure!! I have been playing the beginning of Essential Elements Book 2 I'm up to the Bb major and F major scales and it seems to be going well... Until I go back to the G or D major. I have a hard time finding first finger locations and it also pulls my 4th finger way too low. what can I do to better switch from one key back to the other. Should I be keeping my hand in the same place as if in the G major and only move the first finger way back to get the Bb and Eb? That's really awkward.